The iRocker Paddle Boards 10′ Inflatable SUP is designed with extra thickness (6 inches) to give the increased buoyancy and stability for the rider. It is manufactured in military grade PVC for long-term durability and has non-slip EVA diamond groove deck traction to provide greater comfort underfoot. Other great qualities of this SUP are the ability to accept a lot of weight (compared to a fiberglass board) and the complete ease in transporting and storage. Extremely rigid – the iRocker iSUP is built to be extremely rigid with the ability to easily accept up to 350 lbs with no noticeable impact on the board. It is fully inflated at 15 PSI and gives a solid surface much like the fiberglass boards. Highly durable – this inflatable SUP is constructed with high-quality military grade material which gives the depended build needed. Whether the iRocker is driven over with a vehicle or makes contact with rocks, it is virtually indestructible and unlikely to experience any signs of damage. Portable – the ultra portable nature of the iRocker means there is no need for a roof rack or similar for transporting to and from the river or other open water. It easily fits in the trunk of your vehicle or can be part of your luggage on air travel. Plus, its compact size means it is easy to safely store in the closet. 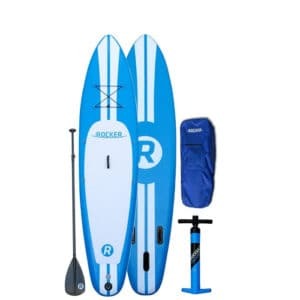 Package deal – the iRocker Paddle Boards 10′ Inflatable SUP is a complete package and includes with everything needed to get water-ready, including the board, carry bag, adjustable aluminum paddle and high-pressure hand pump. 2-year warranty – iRocker stands 100% behind their paddle boards and covers everything except for normal wear and tear. With its ability to cut through the water nicely, the iRocker 10′ Inflatable SUP has the ability to provide a well performing and super light board for all types of water-based adventures. With its solid construction, easy inflate/deflate pump action and high weight limit, this iSUP is perfect for travel via road or air, as well as being light enough to easily backpack to a local lake. The iRocker Paddle Boards 10′ Inflatable SUP has an almost perfect score of 4.9 out of 5 on the Amazon marketplace to provide a high-quality board with plenty of appealing qualities.